It’s that time of year when close to 35,000 runners from nearly 50 states and multiple countries around the world are all training for the same reason, to eventually descend upon the The Circle City, aka The Racing Capitol of the World, aka Naptown, aka Indianapolis, Indiana to run the nation’s largest half marathon. Though there are other mini-marathon races in the US, the Indianapolis version locally known simply as, “The Mini,” is a flat and fast course that includes one lap around the Indianapolis 500 race course prompting some running race fans to drop and kiss the yard of brick from which the Brick Yard gleans it’s name. I thought since this will be my sixth running of the mini-marathon and my 17th half marathon overall I would impart a few tidbits of information to “newbie runners” with less mileage under their belt. Some tips will be for the Indy Mini-Marathon while others will be generalizable to any race. 1. If this is your first race then just enjoy it. You’ve trained to go 13.1 miles. Don’t worry about the finish line or the medal. That’s just a trade-off for the registration fee (and a nice one I might add!). Your feeling of success for setting a goal and going the distance will long outlast the luster of any one medal. You’ll never forget your first mini. 2. Packet pick-up is in the convention center so come downtown Thursday or Friday before the race and enjoy the buzz of downtown Indianapolis. There are plenty of local restaurants in which to dine and shopping galore both at the expo and in the Circle Center mall. 3. The mini expo is anything BUT mini! Save time to be able to walk through the expo as it is LARGE. 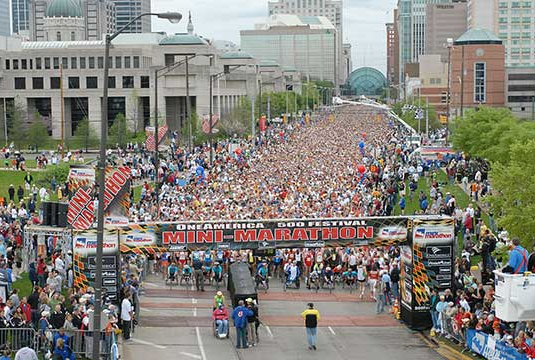 With Indy being the largest half in the nation a lot of vendors set up shop and you’ll find discounts galore for upcoming races around the Indianapolis area. Stay and play! 4. If you are not staying downtown then arrive early on Saturday. There’s plenty of parking as outlined on race website and in the packet, but thousands of locals still drive in so be prepared by arriving early. It will appear as if there is no traffic UNTIL you are within a couple miles of the race THEN it will be gridlock as hundreds of drivers try to see what parking is left. I personally park in a pay-for-parking location and walk 3-4 blocks to the corrals. The reduced anxiety of not having to be in that line of traffic is well worth the $20. I’m happy to donate it to the racing cause! Metered parking a little farther away is lots cheaper, but then be prepared to walk back after the race! 5. Keep a close eye on the weather for the Greater Indianapolis area right up to the day before the race. I have ran the Indianapolis mini marathon in freezing sleet as well as in blistering heat and humidity on the first weekend in May. You never know so come prepared for anything! It is common for the weather leading up to the week before the race to be completely different than the weather for that first Saturday in May. 6. Entertainment abounds the race course from local high school bands and cheer squads to cloggers, line dancers, DJs, and local music talent. I’ve even witnessed a “beer stop” once you are on the home stretch on the backside of the Indy 500 Raceway! 7. Make restaurant reservations WELL in advance if eating downtown! Remember, largest half marathon in the nation. 8. I sort of mentioned this before, but there is NO race day packet pick-up. This is the largest half marathon in the US so there is no way to handle THAT many people Saturday morning. 9. The Indianapolis 500 Track is about the half way point so you are on the back half of the course once you exit the track. 10. If you are new to racing then consider this race to be a potential annual event for you. It’s flat & fast and a good place to PR! Have a great race in May! I’ll be there with my WDW Radio Running Shirt on as usual! Previous PostA Week in ReviewNext PostMotivational Monday!